Cost to install copper roof varies greatly by region (and even by zip code). Get free estimates from roofers in your city. Cost to install copper roof varies greatly by region (and even by zip code). The average cost of installing copper roof is $30,000. How much does it cost to install copper roof? Copper roofs have a distinctive appearance that is instantly eye-catching and recognizable. Copper does not rust, corrode, or break down like other roofing materials, so many buildings constructed around the world in the 1700s and 1800s still have their original copper roofs. 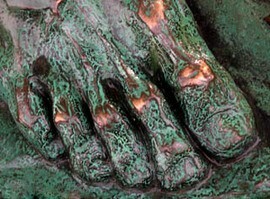 This durability, combined with its beautiful appearance, makes copper roofing still sought after today. This beautiful material runs between $11 and $14 a square foot or $110 to $140 a roofing square for materials only. The average 1,500-square-foot copper roof costs around $30,000 installed. Copper has many positive attributes that make it an ideal roofing material. It is very lightweight, so it will not require a lot of reinforcement to your roof deck. It is also long-lasting because it will not degrade or corrode, so it can last for hundreds of years with little to no maintenance. In fact, a copper roof may be the last roof your home ever needs. Copper can be recycled, and many copper roofs can be made of high recycled material content, making this an environmentally friendly roofing choice. Copper roofs come in many styles. And while they start out a bright, polished color, they eventually oxidize and take on a beautiful verdigris 1, blue/green finish that is striking. Like all roofing materials, however, copper has drawbacks. It is one of the most expensive roofing materials available, costing far more than other metal or asphalt 2 roofs. Like other metal roofs, it can sometimes be loud during a rainfall, particularly if installed over open rafters. Copper tiles, which are among the least expensive type of copper roofing, are often soft and easily bent or dented during installation or a hail storm. While this will not impact the durability of the roof, it can take away from its appearance. Copper roofs are one of the most versatile roofing materials around. Copper can be rolled and cut into many different shapes, giving you tremendous options when it comes to designing and installing your new roof. Copper roofs do not require as much prep work as other roofing types. While they can be installed over some existing roofing materials, this can only be done if the existing material is in good condition. If the existing material is broken, curling, or in disrepair, then it should be removed. Copper should only be installed over an existing roofing material if is in good condition, so any material currently on the roof must first be examined and possibly repaired or removed. The roof deck should be examined as well. While copper roofs are lightweight and the deck will not need reinforcement, any rotting sections should be replaced, and any warped or sagging areas should be repaired. The deck needs to be completely dry, smooth, and flat before installation. So, any existing nailheads or other fasteners 4 that are standing up from the deck should either be more securely fastened or removed. Copper roofs install similarly to other roofing materials of the same style. An underlayment 5 is put down over the roofing deck to help protect it and provide a surface for the roof to be installed over. 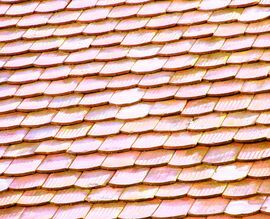 Copper shingles are nailed into place with overlapping edges like asphalt or other, loose shingles. Standing seam, horizontal seam, and long pan copper roofs are laid out piece by piece, and then fastened along their top edges, which overlap one another to form a watertight seam 6. Flat seam roofs are laid out side by side, and then the overlapping edges are folded onto one another and fastened into place. In many cases with a copper roof, the pieces used are often formed on site. Meaning that while prefabricated pans and shingles are available, it is more common for rolled copper roofing to be purchased, then cut and shaped at the job site prior to being installed. This customization allows for a better fit and can adapt to gables, valleys, vent caps, and other intricacies on the roof. It is also one reason a copper roof is so expensive to install. Installation of a copper roof is extremely labor-intensive. In many cases, the copper is being fashioned on site to fit the needs of the roof rather than being purchased in ready-to-install pieces. For this reason, the installation costs of a copper roof can be high, often averaging around $6 a square foot or $600 a roofing square. This is approximately $9,000 for a 1,500-square-foot copper roof. In most cases, the old roofing material needs to be removed before the copper roofing can be installed. Copper ideally needs a smooth, flat surface to be installed on. 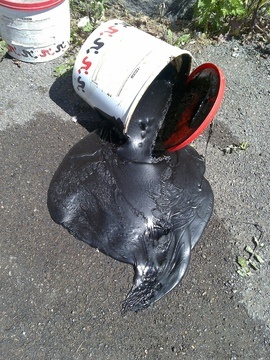 Old asphalt that is curling, broken, or rotting can mean that the roof deck is damaged. For this reason, it is best to remove the old roofing. Roofing removal is around $1 - $2 per square foot, and this is usually factored into the total cost of the installation. Roofing over an existing roof will save you this amount. Copper roofs increase the resale value of a home. Because they are expected to last so long, the new owner will not need to think about roofing replacement in a few years. For this reason, like any roofing replacement, you can see a minimum return on investment of around 68%. Not many roofers or contractors work with copper or have the expertise needed to do so. For this reason, qualified roofers may charge a premium for the installation, which is part of the high cost. Copper roof installations are not suitable for DIY. Due to the specialized work and the heights necessary to complete the project, this is best left to professionals. Copper may be added to small sections of a roof as an architectural accent. This can help keep costs down, while still bringing some of the beauty of copper to the roof. If you want the look of copper on your home, you may also want to consider copper gutters. How long does it take for a copper roof to oxidize? It takes moisture to oxidize a roof. The more moisture in the air, the faster the copper will change colors. It can take 10 to 20 years to fully oxidize depending on the climate, but you can use chemicals to achieve the look faster. How long will a copper roof last? A copper roof can last more than 100 years when properly installed and maintained. What are the benefits of a copper roof? In addition to being beautiful, copper roofs are extremely durable and long-lasting. When well-maintained, they can last over 100 years. They are also lightweight and low-maintenance. 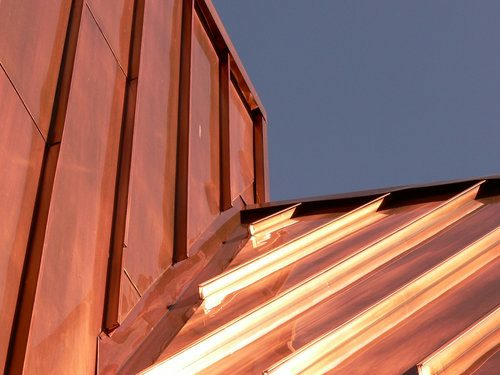 Why do architects use copper roofs? Many architects choose to use copper roofs for their beauty, and the way they enhance the structure both visually and monetarily. Yes, copper is one of the most expensive types of roofing. A 1,500-square-foot copper roof will cost around $30,000 on average. How much does it cost to install copper roof in my city? Cost to install copper roof varies greatly by region (and even by zip code). To get free estimates from local contractors, please indicate yours.